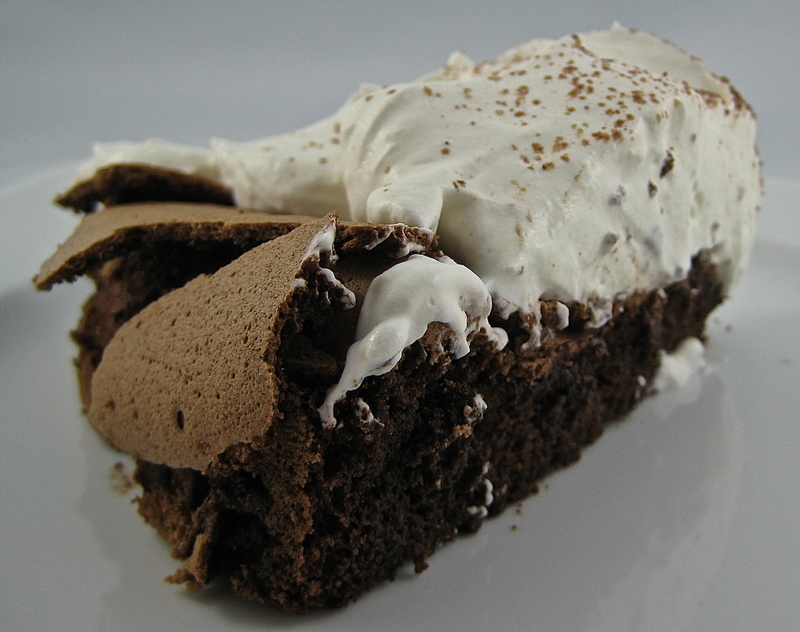 I’ve been making Nigella Lawson’s Chocolate Cloud Cake for about ten years, and it’s always much requested and well received. Except for last year when I made it for Meredith’s birthday and used the wrong kind of chocolate; the result was such a disappointment, but I blogged about the experience anyway in a post called Chocolate, Butter, Sugar, Eggs. One year later, and Meredith again (bravely) requested this for her birthday. I’m pleased to report that I’ve redeemed myself! This time the cake turned out as it was supposed to. The flourless cake rose in the oven with a crackled top and then collapsed as it cooled. 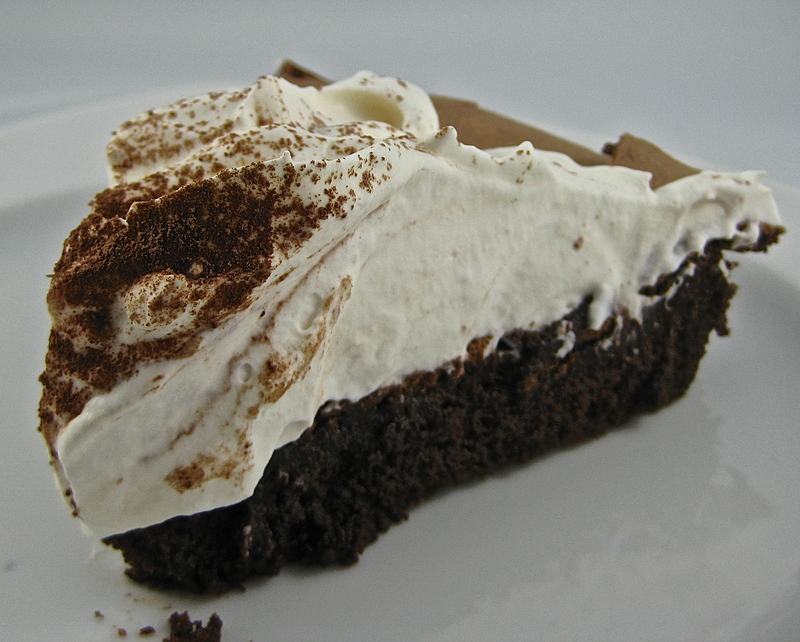 The crust was light and crispy, almost meringue-like in consistency, and the dense, moist and intensely chocolatey filling broke into soft shards as we ate it. Topped with pillows of cocoa-dusted whipped cream, this year’s birthday cake was indeed a chocolate cloud; a special cake for a special girl. Happy Birthday, Meredith! I’m glad to see I haven’t lost my touch. And that’s pretty sweet, especially considering that today marks one year since I took the plunge and made my blog publicly available. Thanks to all of you who’ve helped make this a wonderful experience! You can find the recipe on Nigella Lawson’s website, here. I’d be interested to hear if you have a tried and true recipe that always turns out except for that one embarrassing experience! Delicious, fantastic and totally addictive. And only 100 calories per generous slice. You really are a miracle worker!!!! Yes, this is practically a diet cake!😇 You really must try this cake, but beware … for years it was all I was asked to make, so you might find yourself inundated with requests. I finally put my foot down and said no more for a while so I could make other things too! 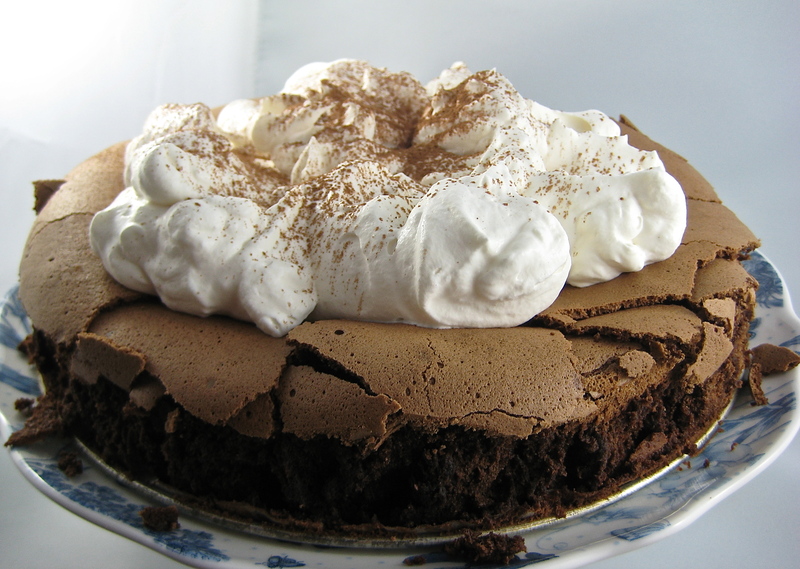 These cakes are totally addictive with a dollop of fresh whipped cream. So tempting. Yes, so tempting and so … gone. No problem with leftovers! Thank for stopping by and leaving a comment! Wow looks amazing! Happy birthday to Meredith and happy one year of blogging! Thank you for the compliment and congrats, and I’ll pass the birthday wishes along! More, you shall have (in the fullness of time) 😊 I’ll be surprised if you ever ask for a different cake for your birthday! It wasn’t around long to look at, was it! Good thing I took pictures! It looks so delicious – what a nice gift! Thank you, Meg. A homemade cake always helps make a birthday even more special. This cake looks fantastic, Mar, in a “shabby chic” kinda way. I can see the crunch that you’ve described and can only imagine the chocolatey goodness inside. I can certainly see why so many request it. It would make one beautiful birthday cake. ‘Shabby chic’ is the perfect term for this cake, John. Wish I’d thought of it first! When the Culinary Enthusiast saw it sitting on the counter he looked so concerned – he thought it hadn’t turned out, but I assured him it was supposed to crack and fall. So much less pressure with a cake like this – the imperfect is perfect! That’s definitely a celebration cake! I love the way it crackles and then the cream piled on top.. I can just imagine how it tastes! Congratulations on one year of blogging and Happy Birthday to Meredith!! Thanks, Barb! Chicago John described the cake as ‘shabby chic,’ a term I think fits it perfectly. 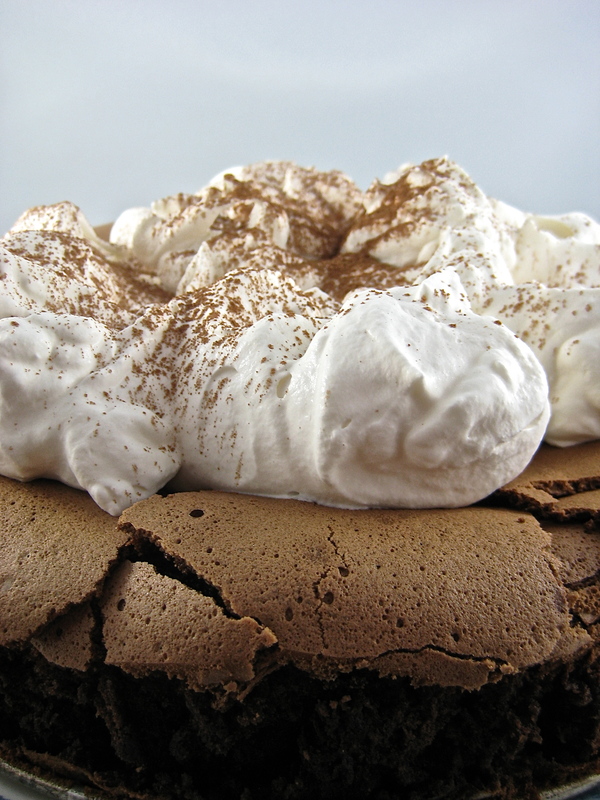 In addition to being delicious, it’s great to have a cake in your repertoire that is so simple to make and to present. Thank you for the congratulations, and I’ll pass the birthday wishes on!